ATP Recordings is pleased to announce our newest signing Mueran Humanos, the Argentinian duo based in Berlin, made up by Carmen Burguess and Tomás Nochteff who have released their sophomore album "Miseress", continuing their post punk, industrial inflected synth explorations first introduced on their 2011 self ­titled debut album. Having created Mueran Humanos in 2006, Carmen and Tomás embody the classic counterculture tradition of an "us against the world" couple driven to greatness through their love of each other and their passion for art. Aptly described by Sean Ragon (Cult of Youth, Blind Prophet Records) as "a post­industrial Lux and Ivy, a garage rock Chris and Cosey, or even a psychedelic Johnny Cash and June Carter." Burguess and Nochteff share the vocal duties, all sung in their native Spanish, but with an emotiveness that transcends any language barriers, with the artwork made by Burguess carrying a voice just as distinct as their music, and the eerie, sometimes disturbing, imagery functioning as its perfect accompaniment. Choosing to forego computer based writing, the band opt instead for stretching and perverting an instrument's presupposed purpose. This way, the very basic line up of Mueran Humanos; bass, synths, drum machines and sampler, generates their personal sound. On Miseress, Mueran Humanos adds for the first time guitars to the formula, supplied by Einstürzende Neubauten's Jochen Arbeit, who also acts as the only guest musician on the album. Recorded at Burguess' and Nochteff's home in Berlin, and mixed in Einsturzende Neubauten's studio andereBaustelle by engineer Boris Wilsdorf, ‘Miseress' bounds between the foreboding and the abstract to more frenetic sounding pop to harsh, obsessive marches. Each song is treated as a separate entity, allowing the record to come together as a whole organically. 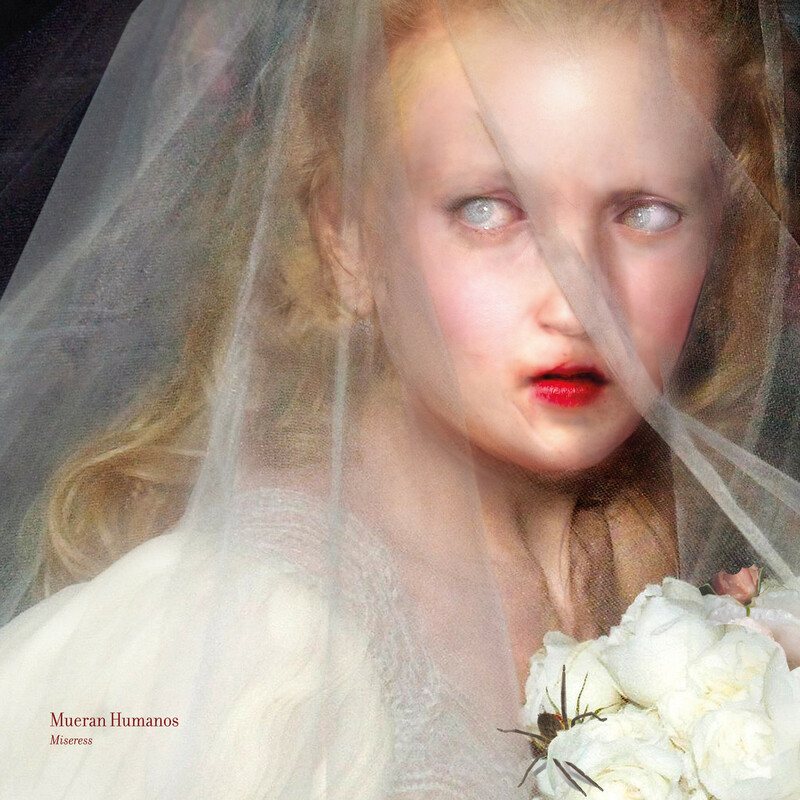 Mueran Humanos encourage listeners to experience ‘Miseress' as you might a thunderstorm: natural and inevitable, it moves seamlessly from beautiful to scary, sad to ecstatic, sliced with points of rage but also flecked with calming lulls.